Rhubarb pie recipe – doesn’t the name just make you think spring? 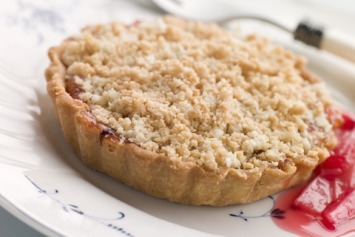 This particular recipe is an Amish rhubarb pie, with a crumble topping. Note that this recipe does not include directions for the crust. Look for our pie crust recipes here. Place the rhubarb in a large bowl. In a smaller bowl, stir together the eggs and melted butter. In another small bowl, mix together sugar and flour and then stir it into the egg mixture. Mix until well combined. Add to the rhubarb and mix well. Mix together the flour, sugar and cinnamon. Using a pastry cutter, cut in the butter until the mixture looks like coarse crumbs. Spoon rhubarb mixture into a pastry lined pie shell. Sprinkle the crumb topping evenly over the pie. Bake at 425ºF for 15 minutes, then reduce the heat to 350ºF and bake for 35 to 40 minutes longer until the filling is set and the topping is golden. You can also bake the filling in a traditional double pie crust if you would prefer. You can make this wonderful pie any time, but springtime, when fresh rhubarb is readily available, is the perfect time for homemade rhubarb pie. This rhubarb pie recipe is just one of our amazing easy dessert recipes. Find them all here. Buying Crust? Originally posted by Renee. For the die hards I must sound like a phony, huh? That might be so, however, I have never been lucky with crusts so I need to buy. What brand should I be looking for? Never Give Up On Your Crust! Try again and never give up until satisfied. This is how I had to learn to cook over the last 30 years. If you use Crisco shortening and follow recipe to the dot your crust will be OK. This pie was amazing. It held together very well and the taste was terrific. I will be making this pie again and again. This pie is delicious. Our town has a rhubarb festival each June and I made this recipe last year and have been asked to make it again this year. retain the egg whites and make a marange to put on the baked pie, then brown in oven.